Top Rank's CEO Bob Arum views Mexican superstar Saul "Canelo" Alvarez as the best fighter in the middleweight division. Last December, Canelo moved up to 168-pounds and demolished Rocky Fielding in three rounds for the WBA "regular" super middleweight title. On May 4th, he returns to middleweight and stakes his WBC, WBA world titles against IBF champion Daniel Jacobs in a high stakes unification from the T-Mobile Arena in Las Vegas. Should Canelo win, he will likely face Gennady Golovkin in a trilogy fight in September. Golovkin fought Canelo to a controversial draw in 2017, and lost a very close majority decision in their 2018 rematch. Arum feels Golovkin would have beaten Canelo last year, but not anymore - because GGG will be 37-years-old next month, and Canelo is still 28. 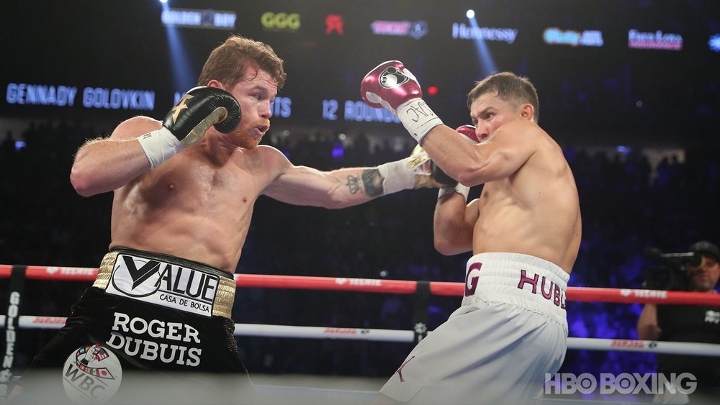 "There is not a boxer [at middleweight] who can beat Canelo today, Golovkin would have gotten to him last year, but he is getting old and Canelo is the best middleweight in the world and there is no one who can beat him [in that division]," Arum said to ESPN Deportes. And he doesn't see Jacobs getting the job done either. "It's a good fight, Jacobs is a good middleweight... if he had fought with Canelo a year or two ago he would have had more of an opportunity [to win], but Canelo is getting to the top of his abilities, he's a good fighter and I think Canelo will be too much for him," Arum said. Having said that, Arum does not view Canelo as the best fighter in the world. He positions two of his Top Rank promoted fighters on a higher level. "Canelo is not the best, I know I'm on a Hispanic program and I like the skills, but there's Vasyl Lomachenko who fights on April 12 at Staples with Anthony Crolla and Terence Crawford who reminds me of Sugar Ray Leonard and fights Amir Khan," Arum stressed. Bob Arum is right on the money!